Two Namco vs. Capcoms, but not Namco × Capcom? Just last week PlayStation LifeStyle reported that Super Street Fighter IV Producer Yoshinori Ono had a “new game” in development. But a new rumor has come out that no one ever saw coming. Last week at EVO 2010, the World Fighting Finals, Namco Bandai’s Katsuhiro Harada and Capcom’s Yoshinori Ono took the stage together for a speech. Although no concrete information was given, an announcement that a certain “fighting game debut trailer” will go live this Saturday at Comic-Con. What could it be? 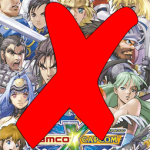 Well, according to GameInformer, TWO separate games are coming: Namco Vs. Capcom and Capcom Vs. Namco. No you didn’t read that incorrectly. The two companies obviously collaborating, but will handle the development separately. Capcom will create a Street Fighter-eqsue experience, with 2.5D graphics and ultra combos, while Namco will create a fighting game with the Tekken 6 engine, with full arena movement and in-depth physical combos. This is not the developers first foray into cross promotion, with fans remembering the Japan-only tactical RPG, Namco × Capcom. Looks like we’ll find out later this week at Comic-Con, be sure to stay tuned!